Not cakes or desserts or sweet things. Have you seen that commercial for the burger that uses grilled cheese as a bun? That's so something I would do. Fat kid city over here. Sometimes. Anyway, you know that breakfast thing, egg-in-a-hole? Where you punch a hole in a piece of toast and cook an egg in it? That's cool and all, but how about instead of boring old toast, you use a grilled cheese sandwich? 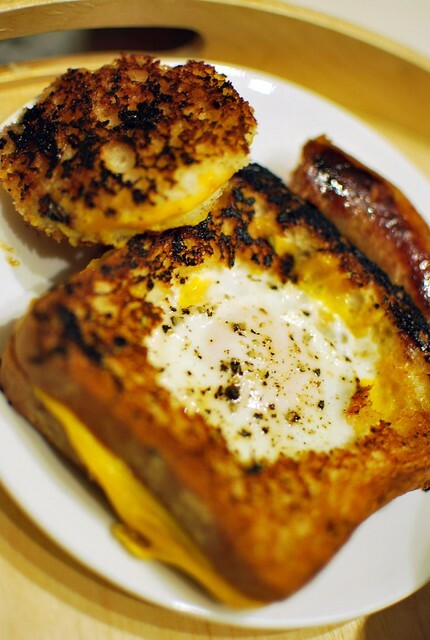 That way, you get cheese in your egg-in-a-hole, since eggs and cheese are, let's face it, meant to be together. This is SO AWESOME. I used Udi's bread, since it's the only GF bread I've found that makes delicious, regular tasting grilled cheese. Use cheese of your choice, I used American (which I do not like at all) because that's what they accidentally gave me at the deli when I asked for cheddar. At least it works in grilled cheese. Butter one side of each slice of bread. Heat up a small grilled cheese making pan, and put one slice of bread, butter side down, in the pan. Place the cheese on top, then the second slice of bread on top, butter side up. Cover the pan (for maximum cheese meltability) and cook for about 3 minutes over medium heat, until the bread is just starting to be crispy brown. Flip and cook on the other side for 3 more minutes, uncovered (for maximum crispiness). Remove your sandwich from the pan and punch a hole in it with a cookie cutter, or some sort of round thing like a cup. Remove the circle of sandwich and set aside. Put your sandwich with the hole back in the pan and turn the heat back on to medium low. Break your egg into the middle, sprinkle with salt and pepper, and cover. Cook about 5 minutes, until the white is set. Remove the egg-hole-sandwich to a plate, and eat, along with the sandwich circle you removed earlier. If your yolk is runny, like I like, you can dip your sandwich circle into the runny egg yolk. I make these for my kids all the time (sans cheese), but this is a great idea! Must try it with some Daiya. YUM. excellent idea. I love making these eggs-in-a-hole - but haven't done it in ages! & with grilled cheese is even better. This looks yummy.. I am new to gluten free blogging and also a UDI's fan.. could you add me to your gluten free blog list? I've made these before without the grilled cheese part, but now you've totally got me thinking! This sounds SO good. What bread do you use, homemade or packaged? I have not seen any packaged bread with this dept! This is our new favorite! I had just made gf sandwich bread with my all purpose gf flour blend with sorghum when I came across this recipe! We added a piece of thinly sliced turkey and couple of pieces of fresh spinach! Awesome! this is making my mouth water! i will have to try this tonight for sure!! the only bread i've found so far is a brown rice bread that trader joe's carries and EnerG breads, but both of them are tiny loaves so cutting a hole in the center for my egg would mean taking out most of the center and leaving mostly crust. Any suggestions? That looks fantastic. Can't wait to try it. Love Udi's bread!! I just made this and it is a disaster. how do you make it so that the egg cooks but the bottom of the sandwich doesn't burn? Be careful with the heat - if you cook the sandwich too much the first time, it will burn when you re-cook it with the egg. Then if you cook the sandwich with the egg over too high heat, it'll burn. I'm sorry it didnt work for you! This is a fantastic turn on the One-Eyed-Jacks my grandmother taught me to make!